The 2012 Borough of Avalon Information and Recreation Guides are now available. This new publication provides detailed information on trash/recycling, beach and bay access, recreation programs, and events. 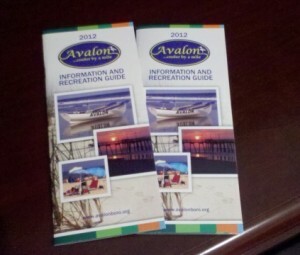 Stop by our office and pick up a copy for your shore house! This entry was posted in Activities, Avalon, New Jersey- News. Bookmark the permalink. Post a comment or leave a trackback: Trackback URL.